Reblog Feike Sijbesma in The Guardian: "Shift to a circular economy is under way, from crop waste to solar"
For more of his blog, please visit the original article on: http://www.theguardian.com/sustainable-business/shift-circular-economy-crop-waste-solar. Jan Peter Balkenende – partner at Ernst & Young, chair of the Dutch Sustainable Growth Coalition (DSGC) and former Prime Minister of The Netherlands – expresses his full support of True Price and our work in this video (in Dutch). The interview is part of a series on leadership in Corporate Responsibility. The explanation on True Price starts at 7:42. Adrian de Groot Ruiz nr. 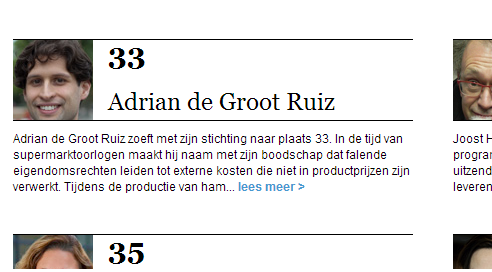 33 of Dutch "Sustainable Top 100"
Director of True Price, Adrian de Groot Ruiz is listed number 33 (in Dutch) of the “Sustainable Top 100”, a renowned list of Dutch professionals who are active in sustainability. The list is published every year by Dutch national newspaper Trouw. 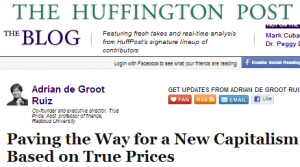 Adrian de Groot Ruiz (Executive Director of True Price) published his first blog on The Huffington Post: Paving the Way for a New Capitalism Based on True Prices. He describes the emerging trend of corporations accounting for true prices of products. Adrian’s contributions will be featured regularly on a permanent blog. Other bloggers on Huffington Post are Gordon Brown, Sean Penn and Ariana Huffington. Top CSR Trends for 2013? True price is one of them! 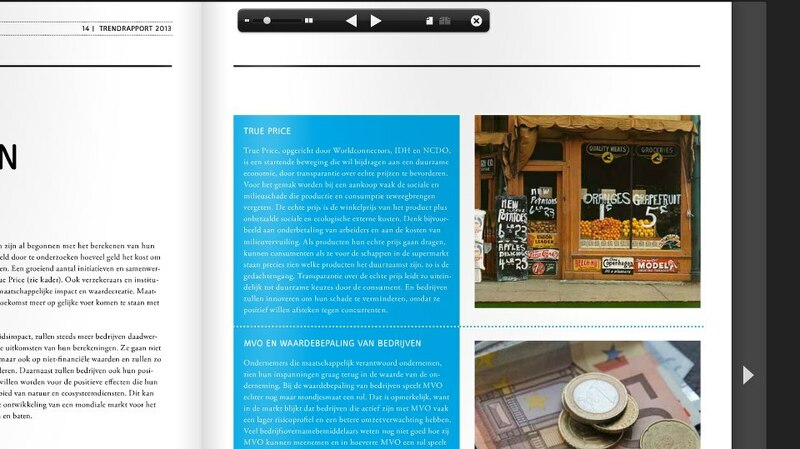 This week, MVO Nederland (CSR Netherlands) launched an interactive report that lists the 10 top CSR trends they see for 2013. Trends that are not only relevant for pioneers in sustainability, but for each entrepreneur – from multinational to small business. And True Price is one of them! Other relevant trends include more attention for sustainability in the B2B-market, increasingly critical consumers and new business models based on surprising coalitions. 2013 promises to be a year of major turns and transformations – all hands on deck!